He wrote this on July 29th for The Baltimore Sun. And a printed subhead on the July 31st edition of Reliable Sources repeated this declaration even though the subject never came up during his byplay with host Brian Stelter. Decades ago, Zurawik and I were competitors when he wrote about television for the now long defunct Dallas Times-Herald. We regularly clashed during those times but since have patched things up. On this particular subject, though -- and with all due respect -- the fact of the matter is that Zurawik is dead wrong. Sorry, couldn’t resist the standard issue politician-speak. Smiling Bill Clinton was a master at getting his TV messages across while Dole tended to snarl and glower before his no-nonsense old-school persona later made him something of a hit as both a Comedy Central “correspondent” and late night talk show guest. But Mondale admittedly just couldn’t cut it on TV at all. Worse yet for him, he was up against the master of the modern electronic age -- Ronald Reagan. The Gipper majestically used pictures crafted by his head image-maker, Michael Deaver. I recall one moment in the campaign where Mondale sweated through his shirt during a speech in a barn while Reagan used Normandy as a backdrop while commemorating the 40th anniversary of D-Day. ABC’s Sam Donaldson duly noted the disparity during his campaign report on World News Tonight. During an interview at the 1996 Republican National Convention, Mondale’s daughter, Eleanor (then an entertainment reporter for the E! channel’s E! News Daily), told me that both her father and Dole have never fully adjusted to the television age. In the subsequent 1988 presidential campaign, Democratic nominee Michael Dukakis wasn’t exactly up against a TV wunderkind in George H. W. Bush. 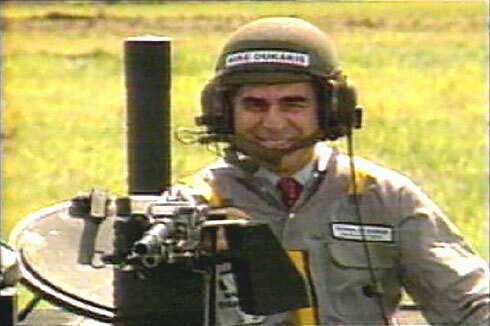 But Dukakis’ television acumen was no better than Mondale’s. His much-ridiculed ride in a tank, complete with helmet and silly grin, were a gift that kept on giving to the Republicans. And in the week before the election, Dukakis appeared on Nightline for an exceedingly dull and mechanical 90-minute interview with anchor Ted Koppel. He repeated the same rote answers while Koppel grew exasperated and at one point told him, “I think you still don’t get it.” He didn’t. And the elder Bush, who had declined Nightline’s offer of equal time, had to do nothing more than chortle with his aides at the lifeless form they beheld. Gore and Kerry also squared off against a Bush -- George W. Neither could muster much of a TV persona, particularly in comparison to Bill Clinton, the Democratic Party’s preceding two-term President. Clinton even withstood the Monica Lewinsky affair, and is still perceived by most as a TV natural. Yes, he tends to go on way too long. But the onetime junk food-imbibing Big Galoot clearly took both George H.W. 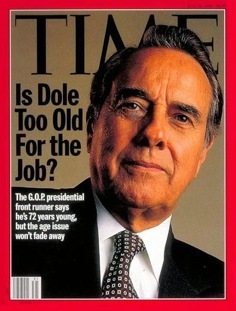 Bush and Dole to the TV wood shed -- time and time again. In comparison, Hillary Clinton is no TV dynamo. “Her failings on the small screen are directly connected to the core problem of her presidential bid: a widespread perception that she is dishonest,” Zurawik writes. But that perception has nothing to do with her TV prowess. Hillary may basically despise the media, as is evidenced by her extreme reluctance to hold formal press conferences. But she’s personable enough as a television “performer,” with a big laugh that actually seems rather genuine for the most part. President Obama, who detests Trump and vice-versa, is far better at projecting a winning, grinning TV persona. What Trump has been good at is gobbling up all the “free media” lavished on him during the primary and now the general election campaigns. CNN, Fox News Channel and MSNBC in particular can’t get enough of him. Lately, not because he’s such a great TV communicator, but because he’s likely to say just about anything during the course of digging another hole for himself. Trump’s stump speeches and frequent press conferences remain rambling and repetitive, but there’s always a better than 50 percent chance that he’ll go off the rails at some point. That’s hardly a mastery of television. But I guess it’s “good television” in terms of not fully knowing what Trump might do to himself. I’d compare Trump to Ross Perot in many respects. He’s a prickly billionaire with an extremely thin skin who constantly berates the media as know-nothings while craving their attention 24/7. But Perot met his match -- in Al Gore of all people -- during the heavily-watched 1993 NAFTA debate on CNN’s Larry King Live. The Vice President was widely perceived to have cleaned his clock, although of course Perot would never admit as much. Neither billionaire is capable of an unfettered apology. There’s always someone else to blame. In Trump’s case, virtually everything is “rigged.” Lately he’s added the general election itself to his list of grand conspiracies. With the first one-on-one presidential debate coming on Sept. 26th -- unless the carping Trump backs out -- one wonders whether he’ll meet the same fate as Perot (but at the hands of the wonky Hillary Clinton). Can his bluster overcome her far firmer command of facts and issues? Hillary has many vulnerabilities, and Trump will very likely try to bulldoze her if he can. 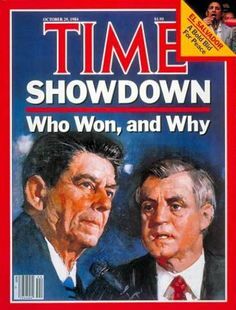 But this won’t be the same as Reagan going against Mondale and winning with a charm offensive and witty rejoinders after “losing” their first debate. Hillary may not have all that much innate charm, but compared to Trump, she’s Betty White. So no, Hillary Clinton is by no means the “worst TV candidate since Richard Nixon.” Not even close. Mondale, Dukakis and Dole are clearly her superiors in this realm while Gore, Kerry and Perot are no better than her equals. As for Donald Trump, well, he’s no Ronald Reagan. Or Bill Clinton. Or Barack Obama. But in the end, he may be right up there with Joe McCarthy.